Here’s the scenario: you’ve been invited to a holiday dinner and it was requested you bring some type of dessert. You really would like to make a cake, but every time you think about all those bowls and all that mixing, you sit back down and start thinking about buying something rustic enough to pass off as your own. Then guilt sets in, and it all begins again. Wacky cake (also known by the appellations War Cake, Depression Cake, Joe Cake, Dump Cake and Crazy Cake) is an incredibly simple chocolate cake that can be mixed, baked and served from the same pan…. Adding to the wackiness, the cake contains neither dairy nor eggs and depends on a vigorously bubbly reaction between vinegar and baking soda … to make it rise. Not all the recipes in Piece of Cake! are for Wacky cake. There just wouldn’t be enough material for a whole book. While Wacky cake and a few close cousins are included -- and even highlighted -- many of the recipes in the book do require eggs or dairy or both. The connecting item is ease. 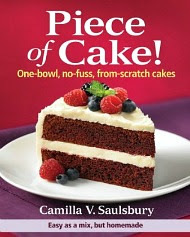 As the sub-title promises: one-bowl, no fuss, from scratch cakes. Easy as a mix, but homemade. Over 175 recipes in all.